A previous blog post here described how you can add and run HitManPro from an E2B USB Removable Flash drive (NTFS or FAT32). The E2B USB drive must be of the 'Removable' type - it won't work if your E2B flash drive is of the Fixed-disk type (a USB HDD will not work either - Hitman will not auto-run when you boot to Windows). HitmanPro needs to see a Removable USB drive which has some special code in the sectors at the very end of the USB drive (currently they use the very last 55 sectors). 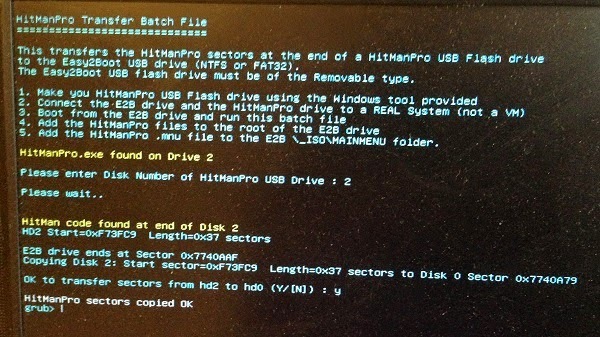 I have written a grub4dos batch file HitManXfer.g4b (included in Easy2boot) which will transfer these sectors from a valid HitManPro USB Flash drive to the end of your E2B USB flash drive. As a follow-on from my previous blog post, I thought you might like to see how to boot Voyager from a .imgPTN partition image AND have a persistence file too. I came across the Xubuntu-derivative Voyager today. It also includes 'Kodi Media Centre' in the hidden right-hand menu which is Xbox Media Centre (XBMC) and it ran fine booting from an E2B USB drive under VBox (set VBox Audio to ICH AC97 to enable audio) and I was quickly watching Al Jazeera (with persistence)! If you have Easy2Boot on a large (e.g. 2TB) NTFS USB HDD, you can add a clonezilla ISO and a .mnu file to E2B. This allows you to quickly and easily make a backup of the first hard disk in all your systems (PCs, notebooks, tablets). You can then perform a 'bare-metal' restore at any later date. The Tutorial 118 on the RMPrepUSB website gives you all the details. You don't have to save the backup images onto the E2B drive, you can connect a second USB HDD to act as the backup device and then keep it in a drawer, happy in the knowledge that you can restore any of your systems at any time in the future. If you convert a Win7 Install ISO to a .imgPTN file and then boot in a VM to the .imgPTN file in E2B and run Setup from the CSM menu, there was a problem in that Setup would overwrite the boot code on the USB drive and thus both the E2B USB drive and the Virtual Hard Disk would not be bootable after a reboot! Recently, there have been several instances when you cannot run the MPI_FAT32 or MPI_NTFS scripts because you need to enter a larger size than the calculated default size for the .imgPTN file. This new version has a small change to the MPI_FAT32 and MPI_NTFS scripts. Instead of running automatically with no user prompts, it now always prompts for the size of the .imgPTN file that it needs to create. Normally, you will just press [ENTER] to accept the default size, but you can type in a different size instead. Although this means it is now no longer fully automatic, I don't think pressing the [ENTER] key is too much of a price to pay for being able to override the default size. If you wish, you can edit the .cmd files and add a * to the command that runs MakePartImage, in order to return it to its normal 'fully automated' mode. Note: this must be done using an NTFS E2B USB drive rather than a FAT32 E2B drive, because usually the .imgPTN file will be greater than 4GB for a full Knoppix OS + persistence file. Versions 9 and 10 of FreeBSD will not boot as an ISO, but the 1.63 Beta 3 version of Easy2Boot and the new MPI Tool Pack v0.044 do support FreeBSD 9 and 10 and pfSense 'memstick' non-UEFI images. E2B v1.A5 and later versions now support the .isoBSD file extension and can directly MBR-boot some BSD ISO files using a small .imgPTN partition image file - see here. GhostBSD.img files are also in the memstick format and work too.